also host my own PBS TV show "Free to Exchange". to spend tax dollars on infrastructure. What will the economy be like in the New Year? Sr. Fellow Benjamin Powell appears on Fox Business Network's "The Independents" show to give his impressions of the deficit, bureaucracies, and economic recovery. Powell talks about long term trends and says Big Government policies are effecting the outlook and the "New Normal" in the economy. Senior Fellow Benjamin Powell discusses the “Business of Charity” with host John Stossel of Fox Business Channel's “Stossel” show. executive editor Jeff Tucker weigh in on the value of the Dollar. Senior Fellow Benjamin Powell discusses the partial Government shutdown on the Fox Business Channel's “Stossel” show. Senior Fellow Benjamin Powell on Freedom Watch discusses Federal youth summer jobs funding and consumer banking problems. Benjamin Powell engages with Tracy Byrnes on Fox Business Network's Freedom Watch on Government consumer safety videos and the enforcement of media piracy laws. Benjamin Powell engages with Tracy Byrnes on Fox Business Network's Freedom Watch on the style of presidential candidates and SEC legal expenses to be paid by taxpayers. Benjamin Powell, Senior Fellow at the Independent Institute, engages with Judge Napolitano on Fox Business Network's Freedom Watch about expiring unemployment benefits and Congressional insider trading. Benjamin Powell engages with Judge Napolitano on Fox Business Network's Freedom Watch about the payroll tax cut and the FDA regulation of salt. Benjamin Powell, Senior Fellow at the Independent Institute, engages with Judge Napolitano on Fox Business Network's Freedom Watch. Benjamin Powell, Senior Fellow at the Independent Institute, speaks on Fox Business Network's Freedom Watch on irresponsible government spending on dead retirees & Hostess Twinkies. Benjamin Powell, Senior Fellow at the Independent Institute, speaks on Fox Business Network's Freedom Watch on unpopular Government spending. Benjamin Powell, Senior Fellow at the Independent Institute, engages with Judge Napolitano on Fox Business Network's Freedom Watch about Europe's budget crisis. Benjamin Powell speaks with Judge Napolitano of Fox Business Network's Freedom Watch about the IRS and the difference between full- and part-time employment. He also comments on the validity of police officers being allowed to use facial profiling. Benjamin Powell speaks with Fox Business Network Freedom Watch's Judge Napolitano about unions trying to rush Elizabeth Warren's job appointment while the senate is still out on recess. He also discusses Swipe Fee Regulations. Benjamin Powell, Research Fellow at the Independent Institute, speaks to Judge Napolitano about the economic “solutions” to resolve our economy this summer. Benjamin Powell, Research Fellow at the Independent Institute, talks to Freedom Watch's Judge Napolitano about Americans wanting to balance the budget without cutting from Medicare funds. Benjamin Powell, Research Fellow at the Independent Institute, speaks to Neil Cavuto on Fox News Channel about the wealthy class are continuing to spend at the precrisis spending levels despite the rising costs of food and gas. Benjamin Powell, Research Fellow at the Independent Institute, talks to Freedom Watch's Judge Napolitano about budgeting more cuts. 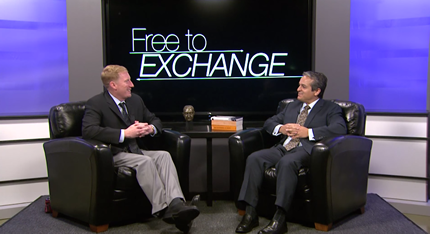 Benjamin Powell talks to Freedom Watch's Judge Napolitano. Benjamin Powell talks to Freedom Watch's Judge Napolitano about President Obama signing the “Healthy, Hunger-Free Kids Act of 2010”. Benjamin Powell on CNBC discusses the pitfalls of U.S. protection of the farming industry with pork barrel farm policies, and how they hurt both Americans and producers in underdeveloped countries. Penn & Teller look at whether Wal-Mart should change their practices. Lou Dobbs calls economists who support immigration “jackasses” and “complete idiots.” I'm pretty sure he is the dumbest one in this clip.